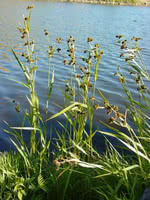 Green Bulrush is a common waterside plant, suitable for erosion control and land reclamation. Despite this, Green Bulrush is very drought resistant once established. Bulrushes can cool nearby areas on hot days. Unlike many of the other waterside plants available, Green Bulrush does not attract wildlife. This makes it a good choice for surrounding residential water sources. Green Bulrush is topped with spiky balls of florets, green in the spring and fading to brown in the fall.